There has been a spot of role reversal in my house of late. 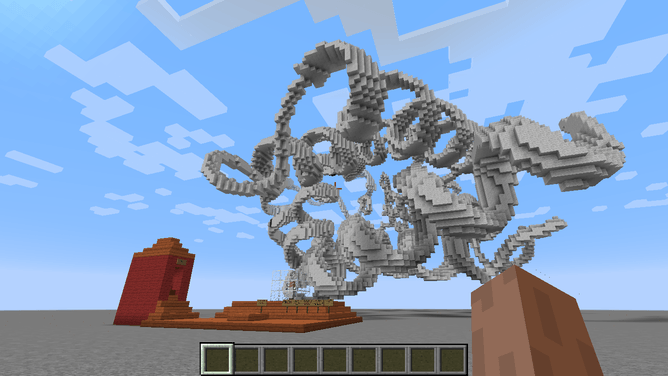 I’ve been at the Minecraft again and my kids are complaining. A while back Microsoft asked me and Joel Mills to work on the latest update of their amazingly popular game. And that update now includes a whole load of chemistry features!! 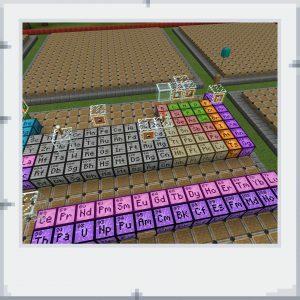 The Minecraft chemistry update makes it possible to mix subatomic particles together and create elements from hydrogen to oganesson as well as the isotopes in between. 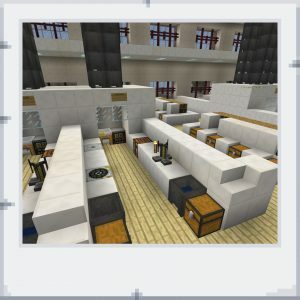 Or you can do a spot of elemental analysis on your Minecraft blocks (with a reasonable approximation to what you might find in reality). And then it is possible to combine elements and manufacture new compounds. These add some nice new features to the game. I particularly like the way you can add metal salts to the torch and they burn with the appropriate colours. The elephant’s toothpaste, glow sticks and helium balloons are also really nice additions. 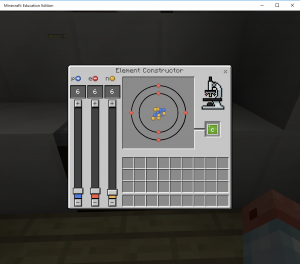 The chemistry update is part of Minecraft Education Edition (MC:EE), a version of the game designed for use in the classroom (but that doesn’t mean you can’t get a licence yourself, costing the princely sum of $5 per year). 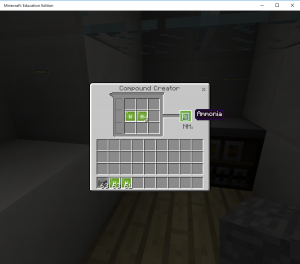 MC:EE is packed with useful features for teachers that many of them would probably like in the real world (with a click of the mouse students are instantly frozen, muted or teleported back to exactly where the teacher wants them). 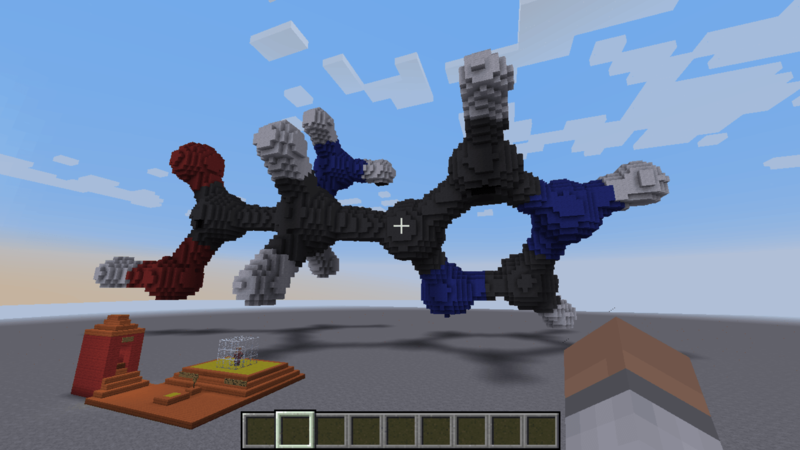 My contribution to the project has been to advice on the in-game chemistry, a set of lesson plans and a bespoke Minecraft chemistry teaching lab (for which Minecraft Global Mentor Joel Mills should get the credit). Our lessons cover everything from lab safety (in which the students encounter a dangerous lab environment and have to spot the hazards and then reduce the risk of accidents by sorting it out) to a spot of analytical chemistry (using the game’s new material reducer). 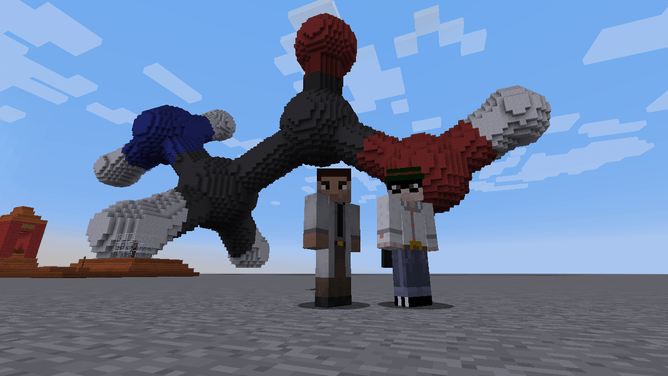 Microsoft have done a cracking job of integrating chemistry in their virtual play world. But they are very much aware that the game isn’t (and can never be) and accurate chemistry simulator. Instead it is really designed to stimulate an interest in the subject. Which is why we also included lessons that encourage students to compare how the rules that govern the Minecraft world differ from that of the real world. How about a spot of halloween chemistry? With nice simple explanations for the trick or treaters. The toffee mix gets very hot, be careful when handling in and make sure there’s an adult helping. 1. 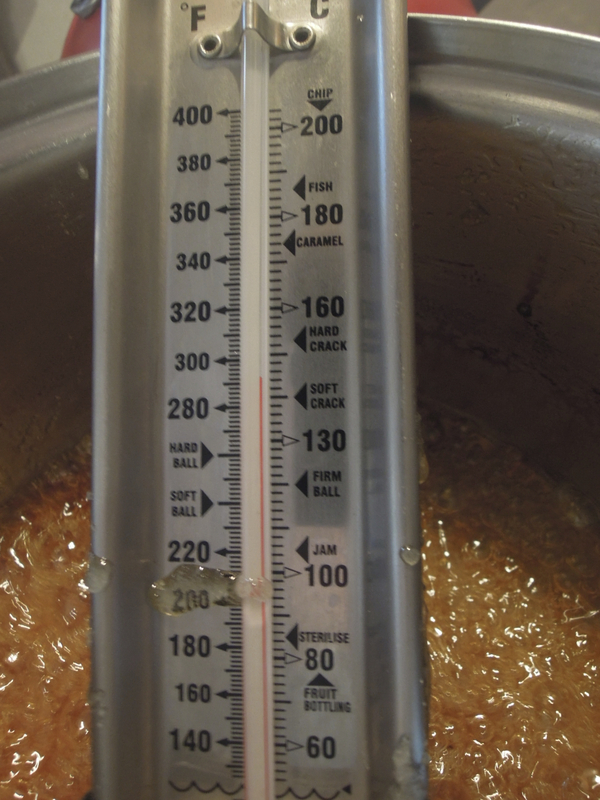 Weigh out 100grams (3.5 oz) of sugar into the saucepan. 3. Heat the mixture on a stove whilst stirring it. 4. 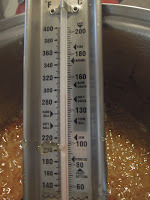 Check the temperature of the mixture. 5. Carry on heating until it reaches 145-150oC (293-302). 6. Quickly stir in 1 teaspoon of bicarb. It will suddenly bubble up. 7. 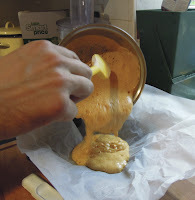 Now pour it into the baking tray, lined with grease proof paper. 8. Leave it to cool. 9. Break it all up (best done with a hammer) and enjoy! So that’s a nice simple recipe for a tasty treat but where is the science? 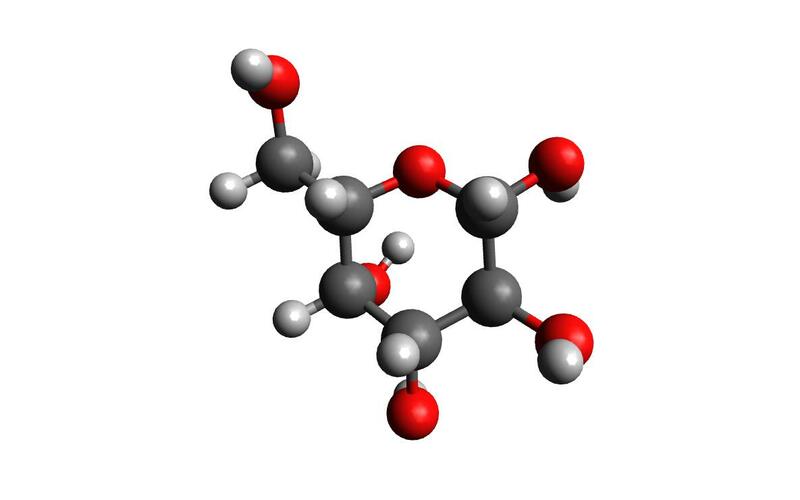 Sucrose is actually made up of a fructose and glucose molecule that have been joined together. 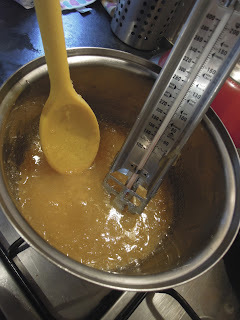 So why do we need these three sugars to make the toffee? Well, when they are mixed all together they interfere with crystal formation. To explain how this works let’s represent each of the sugars with a different shape. 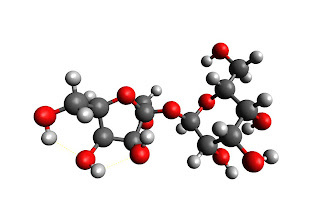 If we have one type of sugar then the molecules can pack together nice and neatly, like in the diagram. And that is exactly what happens in a crystal. 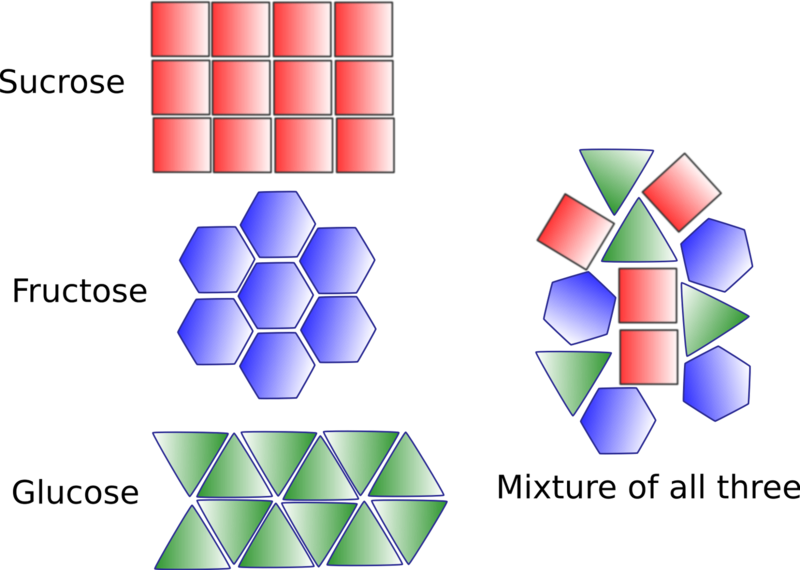 But if you mix them all together they can’t form ordered patterns and so you don’t get crystals forming. So if we tried to make the toffee with just one type of sugar then we’d end up with crystals forming which make for hard dense toffee (more like a boiled sweet). 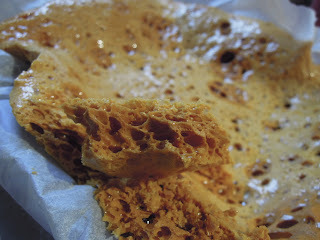 But by using 3 different sugars the crystals don’t form and instead you end up with a brittle, crunchy, glass like toffee. Then there’s the bicarbonate of soda. You normally put this in cakes to make them rise. That’s because when you heat up the bicarb it turns to carbon dioxide gas (hence the bubbles in your cakes). The same thing happens here. When you spoon the bicarb into the hot sugar it almost instantly gets converted to carbon dioxide and causes the mixture to foam up. 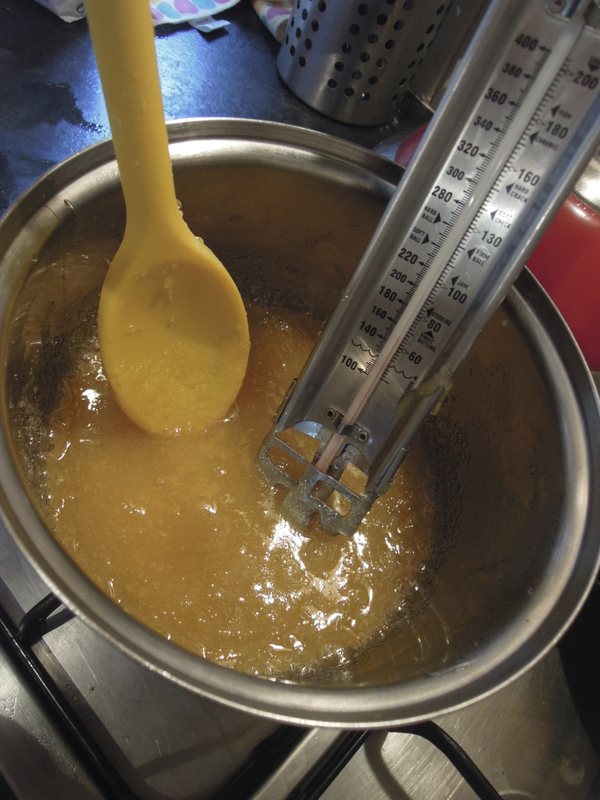 Hope you enjoy the toffee and whilst you do you can find out more about the science of cinder toffer here. 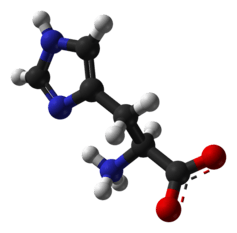 Posing in front of glycine. Review: Chemistry Sets fit for the 21st Century. As a kid I loved my chemistry set. Many an afternoon was whiled away in my dad’s shed, totally ignoring the set’s instructions and randomly mixing the contents of the various bottles. To be honest I can’t really remember learning much chemistry, beyond the fact that it was possible to generate some pretty noxious fumes. I guess its that sort of behaviour that rang the death knell for those sets of old. Today’s high street chemistry offerings seem to have been sanitised to the point of tedium, whilst some even proclaim to be chemical-free (shudder). But there is hope. MEL science have launched a product that brings the chemistry set smack into the 21st Century. And I was pretty excited to get my hands on one. 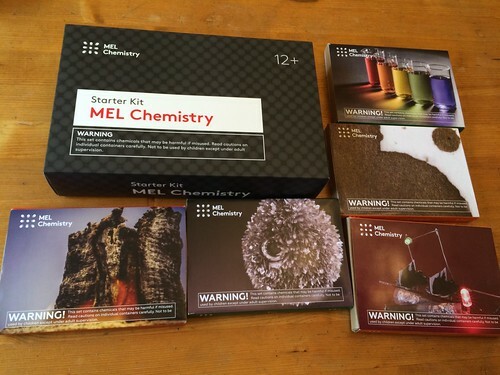 MEL chemistry starter pack and 5 experiment boxes. 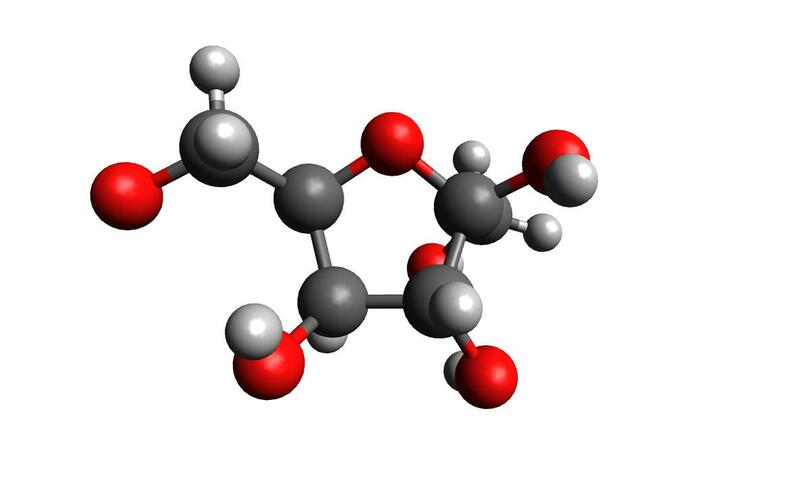 MEL chemistry is supplied via a subscription model. The starter pack is £29.95, and includes some glassware, safety specs, a solid fuel burner, a google-cardboard VR clone, a tray, a neat macro lens that clips onto a smartphone and other bits and bobs. On the face of things this looks a little steep, but you should also take into account a really very good IOS/Android app, which shows various 3D representations (when used with the VR goggles) of all the reagents you are likely to encounter later. All the experiments are sold separately, at £9.95 per experiment set, with 3 delivered each month. The idea being that you each month you receive a new kit. This seems really very reasonable to me, and is just the sort of model that maintains the excitement. Fresh chemistry coming through the door each month should keep up the interest. Each experiment was accompanied by a very good instruction card and a detailed online page. The webpage goes into far more depth that you would expect for the target 12+ age group. But its all clear and well written. A very minor criticism is the commentary to the videos, sometimes the heavy (Russian?) accent makes things a little difficult to follow. We (a small Lorch and I), cracked open the ‘Tin set’ and fired up the accompanying video. Everything is very well packaged with a lot of thought going into how kids should dispense solutions safely. My lab assistant, for this experiment, has quite a reputation for knocking fluids flying, but in this case, and despite a couple of up ended bottles, nothing was spilt. So over to the real action. The ‘Tin set’ contains two experiments. 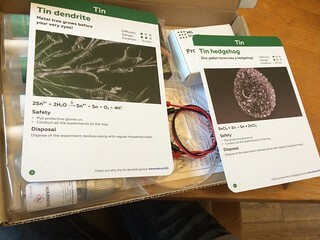 First, the tin hedgehog, which simply involves dropping a zinc pellet into a solution of tin (II) chloride. 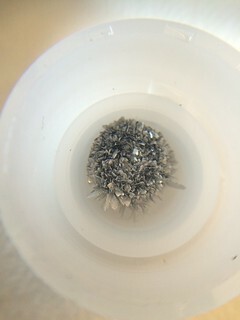 Tin crystals quickly form on the pellet, these are quite small and would be difficult to see without the help of the clip-on macro lens. So with the expanding crystals captured live on my phone’s screen my co-experimenter was quite impressed. 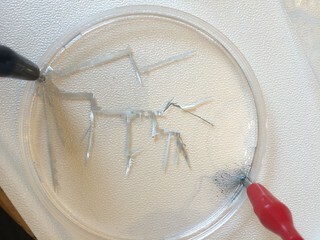 Then we moved on to the tin dendrites. Again the method was easy for my pre-teen helper to follow. And this time, as the beautiful branches of tin struck out across the petri dish there was some genuine amazement in the room. Tin hedgehog, as seen via the kit’s macro lens. So far so very impressed. By linking all the experiments with excellent online and smart resources they should really engage the budding chemist and ensure they learn a heck of a lot more than just how to gas themselves. In short they are fun, safe and bang up to date. I’ve got previews of another 4 experiments to try and will let you know what I think. If they are up to the same standard I’ll be signing up for the other 34. EDIT: Note, a previous version stated that the sets cost £9.95 per month. This should have read £9.95 per experiment set. The text has been altered to correct this.